The Wild celebrate a goal by forward Justin Fontaine (14) in the second period against the Edmonton Oilers at Xcel Energy Center. 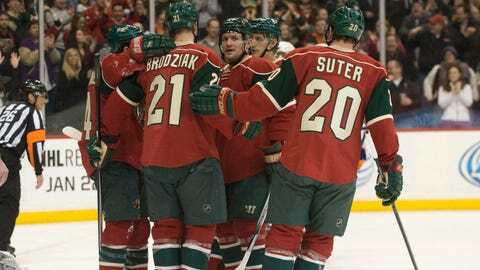 ST. PAUL, Minn. (AP) — Unable to get out of their own zone and hearing a few boos from the home crowd in the second period, a goal from an unexpected source helped the Minnesota Wild regain control. Nate Prosser scored for the first time in 68 games, Jason Pominville had a goal and an assist, and the Wild beat the new-look Edmonton Oilers 4-1 on Thursday night. Edmonton spent most of the second period in the Wild’s zone, but didn’t generate many shots. When the Wild finally got set up on the other end, Prosser’s slap shot hit Ben Scrivens’ left glove and fluttered in to give Minnesota a 2-1 lead. "Yeah, we hear those fans. We know that our play wasn’t up to par there for a while in the second," Prosser said. "We weren’t executing the way we should. "As soon as that turned around, we had a few shifts in their zone and Pominville made a nice pass to me and I was just trying to get it high up over the goalie’s shoulder and it happened to go in." It was Prosser’s first goal since Feb. 7, 2012, in Columbus. Jordan Eberle scored his 15th goal for the Oilers, who haven’t won on the road in their past six tries. Several Edmonton players stomped off the ice in frustration after the end of the second period. "It’s an even game and now you’re down by two," Edmonton coach Dallas Eakins said. "I feel like a broken record sometimes, but you just start chasing the game again." Justin Fontaine and Jason Zucker also scored to help the Wild win for the sixth time in eight games and bounce back after getting shutout on Tuesday. Fontaine stuffed in a rebound 2 minutes after Prosser’s goal and Zucker scored 8 seconds into the third on a give-and-go with Dany Heatley. "Walking out for that third period, I was thinking, `Boy, it’d be nice to grab another goal here quick,’" Wild coach Mike Yeo said with a grin. 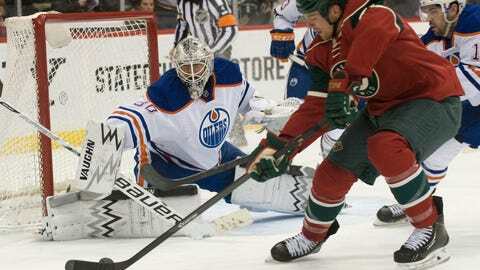 Scrivens had 29 saves in his Oilers debut after he was acquired Wednesday in a trade from Los Angeles. Scrivens replaces Devan Dubnyk in goal, who played in 32 games for the Oilers and was traded to Nashville for center Matt Hendricks on Wednesday. "I felt pretty good, but I’ve got to find a way to make another save here for the guys and give them more of a chance," Scrivens said. "Overall, it was another good learning experience for me." While the Oilers were incorporating new players into their lineup, the Wild carried on without several of their key players. Zach Parise (foot) and Mikko Koivu (ankle) remain out and top goalie Josh Harding hasn’t played the past eight games as he recovers from an adjustment to his multiple sclerosis treatment. Defenseman Jared Spurgeon is also out, which opened the door for Prosser to start contributing after being scratched several times early in the season. "Obviously, we’re incredibly happy for him to score that goal tonight," Yeo said. "But even if he doesn’t score that goal, he’s going to go out and give you a great chance because of the way that he plays, the way that he defends and manages the puck well. He competes hard every night. You can win with guys like that." Darcy Kuemper had 20 saves and improved to 3-1 since being recalled from Iowa of the AHL. He’s stopped 111 of 116 shots over that span. Despite the injuries and despite the rough patch in the second period, Kuemper was confident that the Wild remained in control. "There wasn’t really ever a doubt tonight that this game was going to go our way." Edmonton — the worst defensive team in the NHL — has allowed 28 goals in its past six road games and desperately needs the gritty Hendricks to provide more toughness and Scrivens more consistency in the net. Scrivens allowed 1.97 goals per game while filling in for the injured Jonathan Quick in Los Angeles, but will probably see that number rise on the defensively challenged Oilers.